Now that we did it, we want to acknowledge those of you who were actively responsible for working with us to make this possible!! There are many others that went to incredible lengths, so a BIG THANKS to them as well. Italics are events along the way and green are people in DC that if we didn’t have behind us, would have fallen apart. Aug, 2010 Sherwood Neiss, Jason Best & Zak Cassady-Dorion The Startup Exemption Faced with the funding void came up with the idea for equity-based crowdfunding then headed to Washington and worked tirelessly even past the signing ceremony at the White House and are still going! February, 2011 Chairman, Rep. Darrell Issa(Peter Haller, Hudson Hollister & Drew Colliatie) Oversight & Gov’t Reform Committee Asked us for initial questions to put in letter to SEC. Letter stirred up our first press in the Wall Street Journal. Called first Hearing on Hill. 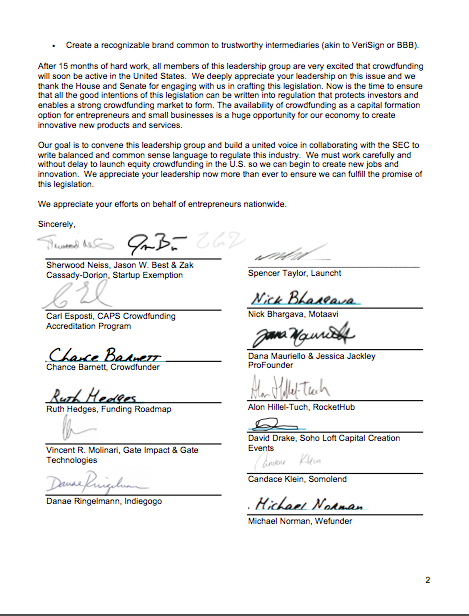 Paul Spinrad/Jenny Kassan Sustainable Economies Law Center Wrote the initial crowdfunding petition to the SEC. Provided continual input and guidance. Lucas Sommer, David Sinopoli Socialated Set up our social media campaign – hello twitter! Senator MerkleySenator Bennet, Senator Brown (Andy Green, Brian Appel, Brian Murphy, Marne Marotta, Nat Hoopes) Introduced 2 Senate versions of the House Bill. Builds upon HR2930 by adding back into the legislation parts of our original framework. April, 2012 President Obama Sherwood, Jason, Zak and Karen attend the bill-signing event at the White House. 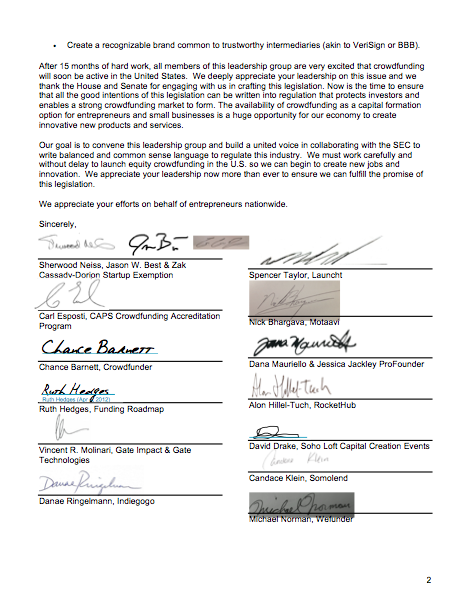 We help organize a Leadership Group to address concerns of investor protection with the goal of forming the Crowdfunding Coalition to work with the SEC and represent the industry’s interests in both Washington, DC and to the Trade. The Crowdfunding Global ProfessionalAssociation CFGPA is formed for Trade Association and The Crowdfund Investing Regulatory Association CFIRA is formed as a potential SRO. Dara Albright, Chance Barnett Jason Best, Nick Bhargava, Luan Cox, Candace Klein, David Drake, Carl Esposti, Berkeley Geddes, Kevin Berg Grell, Alon Hillel-Tuch, Ruth Hedges, Brian Meece, Vince Molinari, Michael Norman, DJ Paul, Spencer Taylor, Brian Tsuchiya, Freeman White The Crowdfunding Leadership Group The amazing group of crowdfunding portals, experts and advocates that are continuing the relay in the 270-day rule making process with the SEC. These guys and gals are a phenomenal group of spirited, dedicated, and motivated people. Jason and I are beyond happy to be taking on this next phase with such a knowledgeable and experienced group. The New York Times came out with an article yesterday that caused me to seriously question the publication’s true allegiance. The piece, written by Andrew Ross Sorkin and titled, “JOBS Act Jeopardizes Safety Net For Investors”, uses Groupon’s current woes as an excuse to denounce the overwhelmingly bipartisan jobs bill just days before Obama is expected to sign it into law. His title alone makes me cringe. Since when does investing come with safety nets? Investing involves risk. In fact, the entire concept of investing is weighing risk versus reward. Mr. Sorkin, do you even comprehend the magnitude of what your article intimated? You are basically insinuated that it should be the Government’s responsibility to assure investment returns. Somewhere, Ayn Rand is rolling over in her grave. Let’s get one thing straight, I am all for investor protections. But unlike you, Mr. Sorkin, I also support a capital markets system that provides fairness to ALL investors, not just to the 1%. 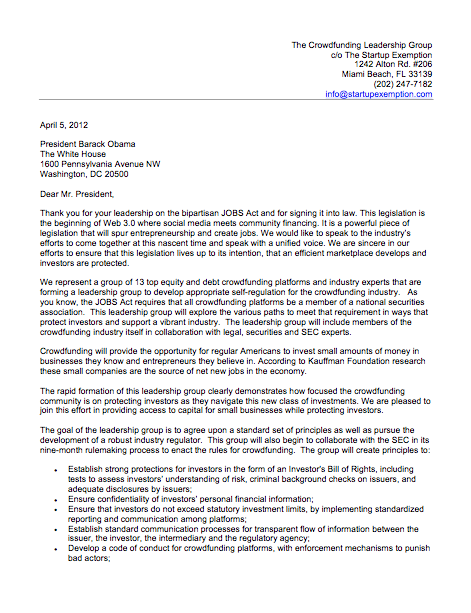 I further endorse a bill that allows for investor protections without sacrificing our nation’s greatest innovators. For far too long our capital markets have been hijacked by PIPE funds, program traders and a handful of supersized investment banking and institutional firms at the expense of our small businesses. The JOBS Act democratizes our capital markets, brings equality to retail investors as well as emerging companies, and most importantly, it hands the capital markets back to the 99%. 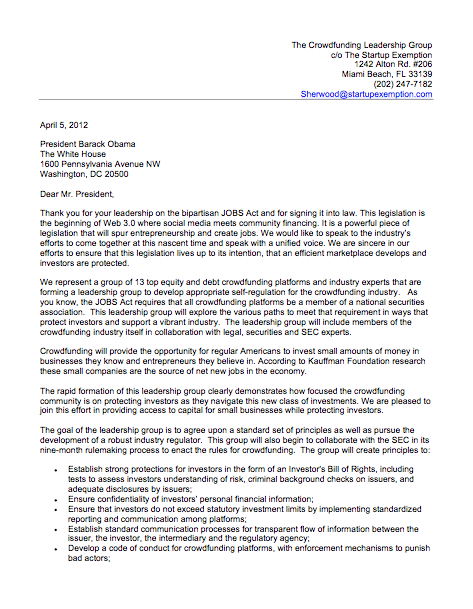 The “Crowdfunding” component of the bill that you condemn actually levels the investment playing field by permitting smaller investors to invest prior to a company’s greatest growth spurt as opposed to having to wait until its IPO when the majority of the appreciation had long passed. Why do you take issue with the 99% being afforded the same opportunities to grow their money as the 1%? Since you obviously lack an understanding of crowdfunding, allow me to educate you. The Crowdfunding Marketplace could not be more distinct from the unbalanced conventional markets you outwardly shield from crucial regulatory reform. Unlike most public market investors, crowdfund investors are long term, benevolent shareholders who invest in a company, not because they have a “get rich quick” mentality, but because they truly appreciate a company’s business, its mission, its value to the community and its potential impact on society. In fact, crowdfunders value a company’s business so much that they are currently funding projects without even receiving an equity stake. Imagine a PIPE investor forgoing his equity because his true motive is to see the company succeed? I can’t even envision him not securing his return by demanding a steep discount plus a warrant kicker for “risking” his capital. Crowdfunding allows businesses to obtain shareholders whose interests are more aligned with their own. This alliance gives companies a greater chance to succeed. If crowdfunding achieves nothing else but altering investing behaviors and making it “chic” to be a long term shareholder again, it will go a long way towards improving our capital markets, our economic future and even advancing society as a whole. Finally, Mr. Sorkin, please understand that if you regulate the risk out of our capital markets, you will be regulating our nation right out of innovation, growth, global competitiveness and yes, job creation. Not every company will succeed. In fact, many will not. But our capital markets were built on the back of many failures as well as successes. Had it not been for those failures, there might never have been an Apple, Intel, Microsoft, Google or a Facebook and you would have written your irresponsible propaganda cloaked as journalism with a fountain pen instead of on a keyboard. The New York Times needs to stop decapitalizing the markets under the pretense of investor fairness when their actions will only lead to greater injustice. If it truly wants this nation to prosper, it will put an end to encouraging mediocrity and dependency through careless rhetoric of unwarranted safety nets.